LaMarcus J. Hall has faced many of the barriers black males face today. Instead of keeping the battles within, he took his struggles and created strategies to motivate young teens. From K-16, LaMarcus offers a snapshot of where he came from and refuses to remain silent. He covers issues such as: being a nerd, pushing through hardship, dealing with failure, and more. LaMarcus J. Hall received his Bachelor of Science & Master of Education from Georgia Southern University. 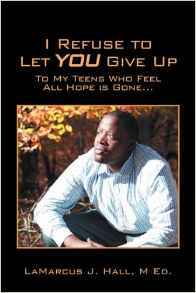 LaMarcus has been through the many struggles our teens face today. He offers a new solution to the various problems teens face by finding motivation through your circumstances.